It is no small feat to develop and keep rituals in our lives. On the other hand, rituals need to change and evolve as our lives evolve. At some time during college, my sister and I developed a ritual of going into downtown Chicago the Friday after Thanksgiving. Our purpose was to see the Christmas windows and then eat lunch under the tree in the Walnut Room. Note that we got in line about 30 minutes before the Walnut Room opened – otherwise, we could wait several hours for one of those coveted spots. My father-in-law found it highly amusing. He couldn’t relate to it, but each Thanksgiving he would check with me that we were still doing it the next day. After my sister stopped coming home for Thanksgiving, I would go see her. We would take the kids to the auditorium at Dayton’s. Some years we ate lunch afterwards at their restaurant, some years we didn’t depending on our energy and patience. Eventually that stopped too. I was too far away, the kids were too old, and we were all too busy. Other family rituals developed instead. The newest ritual is sending each other text messages with a picture of what is happening in our life at that moment. I get pictures of her grandpuppies napping on the couch, I send back a dog chasing bees on the deck. I got a winter sunrise from her earlier this year, today I sent a sunset from our deck. It helps us stay in touch and get a slice of each other’s life. 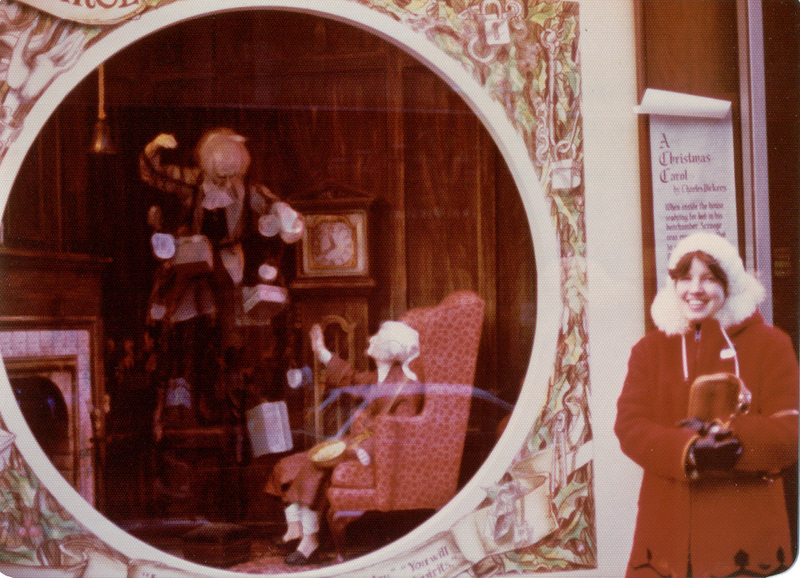 Here’s a picture from over 30 years ago, of me standing in front of one of the Christmas windows. The theme that year was A Christmas Carol. The feat of keeping rituals changes and evolves, but the memories last a lifetime. Word for tomorrow – ENTERING. If you prefer to work ahead, see the list for the week under “A Word A Day”. It really is fun to go see the decorations. That would be a great tradition to start up again.